Renovations to artwork in the main auditorium take place over the summer. 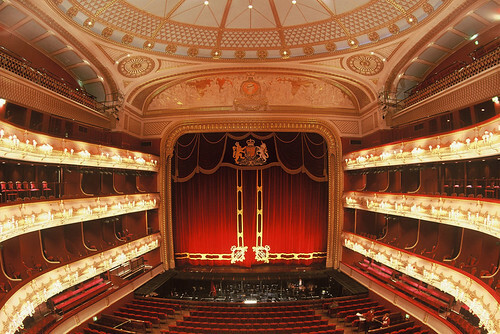 The beautiful velvet-clad auditorium of the Royal Opera House is a Grade I listed building that dates back to 1858. 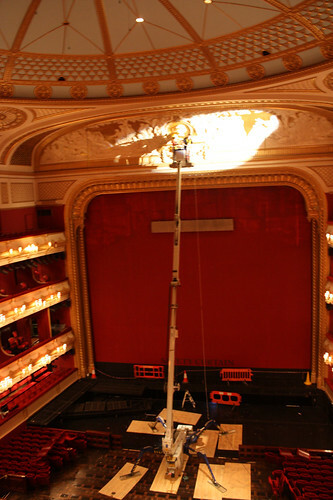 Monitoring and maintaining the auditorium and its historic contents is the responsibility of the ROH Collections Department. Now, with The Royal Ballet and The Royal Opera on their summer break, the auditorium stands empty, and ROH Collections have seized the opportunity to undertake a conservation project above the stage. 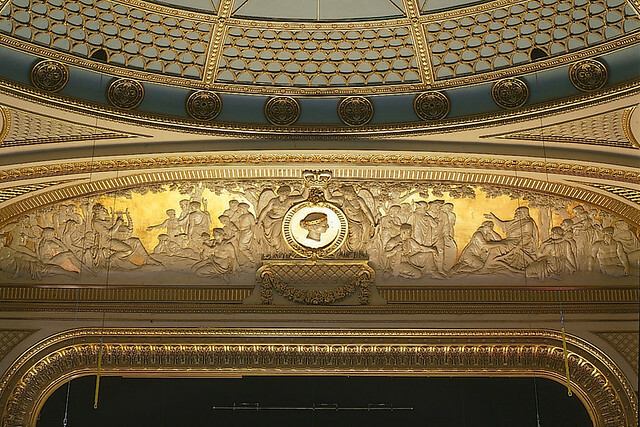 High above the proscenium arch is a decorative gilt-and-plaster frieze depicting scenes from mythology, with a profile portrait of Queen Victoria at its centre. 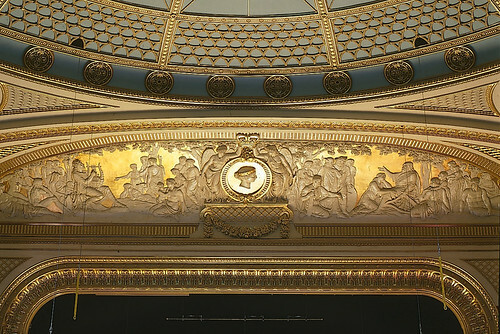 The frieze has been in place since the current theatre opened in 1858 and was last restored in 1998 when the entire auditorium was renovated. However, recently cracks have started to appear in the plaster figures and the gold leaf has started to peel. The time has come to call in the conservators. Although the problem was identified in mid-January 2012, due to a heavy schedule there were only two days last Season when accessing the frieze was possible. 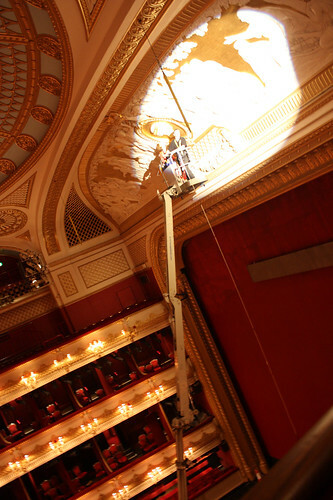 So, with no performances or rehearsals on stage last week, the seating was removed from the Orchestra Stalls, a spider lift was installed, and a brave conservator went up in a very small basket to investigate the damage up close. The cracks in the frieze seem to have been caused by fluctuating temperatures and humidity created by the large number of people (2,250 to be precise) who visit the auditorium each night. These changing conditions cause the frieze's plaster and paint to shrink and expand, which has led to flaking and cracking. With just two days to repair the damage before the auditorium was in use again, the conservator (from Plowden & Smith, a company who carry out nearly all of the Royal Opera House’s building and object conservation) only had time to consolidate the most obviously damaged areas in the centre,while taking detailed notes and photographs of the rest of the frieze. The end result of this work is fantastic – even eagle-eyed audience members will be unable to see anything out of the ordinary when they gaze above the stage. Collections will continue to monitor the condition of the frieze throughout the year (with the help of a telephoto lens) and a conservator will be back up there next summer to ensure it continues to look good for years to come. 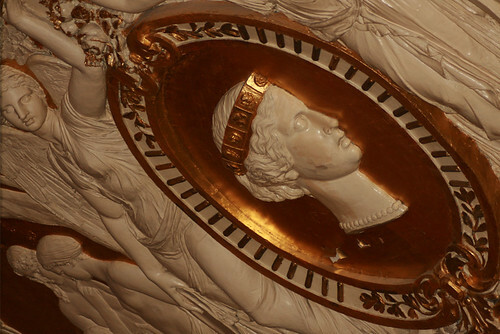 Find out more about the auditorium of the Royal Opera House by joining us for one of our Velvet, Gilt and Glamour tours. If you feel inspired to support the work of the Royal Opera House, there are many ways to take part, from becoming a Friend of Covent Garden to sponsoring a role in a ballet or opera. We receive all donations very gratefully.